Alice loves to wear pencil skirts. Especially with blazers. This combination is part of her signature style so no wonder then that she absolutely nails this look. Let’s find out more about Alice’s unique style and why she likes to wear pencil skirts so much. Hi Alice. Thanks for taking the time out to answer a few questions for 40PlusStyle.com. Can you tell us a little bit more about yourself? I am a full time working mother with a 5 year old little guy and have been happily married for 7 years. I work in the banking industry where suits and dark colors are the norm. (So I tend to stick out with my bright outfits and pattern mixing outfits.) I laugh as I type this but my part time job is being a chauffeur to my son for his very active social life. When I am not working or chauffeuring, I love to read, exercise and of course shop. Can you tell us a bit more about your blog Happiness at Midlife and why you created it? Before blogging, I had a closet full of clothes and kept using the same items over and over again. I started taking pictures of my outfits to encourage myself to use my clothes in a new way and use what’s in my closet. I loaded these pictures on Pinterest and from there I discovered fashion blogs. I started reading a few and didn’t have any connections to any of them. I figured that by starting a blog, I will find people of similar interest in clothes and hopefully connect with them as well. I’ve always had an old soul and with my career in a conservative industry, I would describe my style as feminine with a twist. I love clothes that enhance a woman’s figure with a defined waist or extra details like ruffles and lace on a top. I really try to focus on a flattering fit and wear what makes me comfortable. I love clothes that have extra details that may only be seen by me. For example, I love jackets that are lined in pretty prints or bra strap snaps on your tops to keep your straps in place. I live in southern California where it’s very laid back. With a young child and a husband who wears shorts on the weekends, I tend to keep my weekend outfits very laid back as well. I would say my lifestyle has a bigger influences on my style than where I live. If you asked me this before starting my blog, I would say no. But looking through my pictures, I would say it’s a good pencil skirt with a blazer. I am so drawn to the shape of a pencil skirt and how feminine they make me feel and I love that they are flattering on most body types. I also never realized how many cuts and styles of blazers there are. I do try to focus on blazers that are a little more unique with details (like a little peplum or some ruffles). I think that would be my lifestyle again. I always focus on function and comfort first. If I am having a meeting with people I don’t know, I will dress more in my traditional banker suit (dark colors) and maybe have some fun with my shoes. I do snap pictures of outfits that catch my eye (from magazine to store displays) and keep them in a folder on my phone and see how I can create the outfit with items in my closet. The quick answer is probably no but I may do this on a subconscious level. I’ve learned that when I wear a color that is not flattering to my skin tone, it helps when I wear that color on the lower half of my body. Then it works. In regards to dressing for my body type, I think it changes with fashion trends. I am 5’4” and I have very athletic legs. In the past, wearing cuffed jeans with flats would be discouraged since it will just shorten me even more. I read somewhere to avoid ankle strap shoes as well to reduce the size of my calves. I will say that wearing cuffed jeans with flats is pretty acceptable even for a shortie like me and it’s something I wear a lot on the weekends. I also own a handful of ankle strap shoes and love them. In my early 30s I wore matching suits to work everyday. Now that I am more comfortable in my own skin, I do take more risks with colors as well as pattern mixing. I believe in dressing what makes you comfortable. As I mentioned earlier, I have always had an old soul and was never comfortable wearing anything that showed too much skin. I never dressed this way in my younger days and will not start now. I shop at mass retailers where younger women shop and whatever I buy, I make it my own. Confidence is key. You can wear anything if you wear it with confidence and a smile. I have always been interested in fashion. It’s not a priority for me to be in the latest style. Rather I just want to look like I made an effort to dress before leaving the house. I have never been comfortable wearing yoga pants and workout gear all day long. You can wear a plain white tee and jeans and add a scarf and you will look 10x more put together. You only have one time to make a first impression. You never know who you will meet or bump into. I love the fit of these pants and the subtle pattern mixing with the floral heels in this outfit. It’s professional and a bit of fun at the same time. I like this outfit because of fun pattern mixing and the use of tube skirt (which is trendy now) but still works for my body type without feeling too self conscious with the addition of a blazer and tights. Black and white is always a go to color for me and with the pop of pink – it added a fun factor to this work outfit. I had purchased these pants and featured them on the blog and asked readers if I should hem them and the answer was an overwhelming Yes! I love the feedback and suggestions I get from everyone. This is an outfit I would never have tried had I not been reading fashion blogs. I use my blazers typically for work and rarely for the weekends. I love the mix of dress up and casual wear of this outfit. Yes and no. I tend to wait and see on some trends. When peplum came out, I was really on the fence about it. I’ve learned how well they define your waist and now can’t stop wearing them even if they are not on trend. One trend that I am excited to see is printed sneakers. I recently bought a pair of leopard canvas sneakers and love them because they fit into my lifestyle so well. If you use a plain white tee and jeans and add a pair of pair of these fun sneakers – you just elevated your outfit just a bit more. Have fun with your clothes and take some risk… after all it’s just clothes. I have come to realize that most people don’t really care if your colors match or you are in style, so just wear what makes you happy. I don’t really have much plans for my blog since it is just a fun way for me to connect with some great people out there. I have recently started a series about fitness on Saturdays. I have struggled with losing a few pounds and wanted to share my journey and hope to inspire others and keep myself motivated. Part of me feels a bit silly writing about clothes which is a bit shallow and I hope to feature some individuals that have had success in improving their health and hope that I can help spread the word about being healthier. Thank you so much for this interview Sylvia. I have enjoyed discovering all the stylish ladies that you’ve interviewed and all the tips that you have shared on your site. I am so glad there’s so many of us out there that are not in our 20s or stick thin with designer clothes at our disposal but still love fashion. It just goes to show you that you can be fashionable at any age, size or budget! Thanks for your great answers Alice. 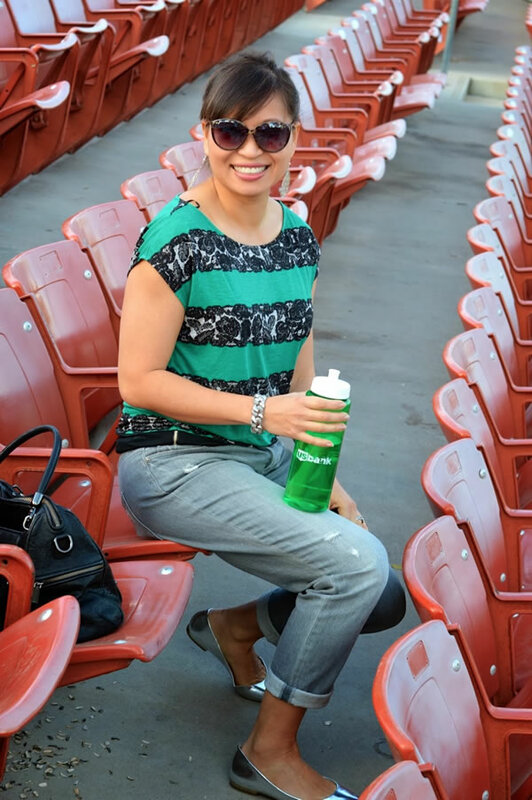 Don’t forget to check out her very stylish blog Happiness at midlife! Which of Alice’s outfits is your favorite? Alice, I laughed when I read your comment about your calves, because when I had seen the photo under your statement of your age, and before I had read further, I had noticed your calves and thought how beautiful they are and how I wish I had your calves! I would never cover mine if they looked as shapely as yours! That is too funny Sarah! I have always been so self conscious of my calves, they are not fun when I have to buy boots. And your comment about clothes is so true. I’ve never really thought about it that way before. I guess that’s probably a big reason why I never wear sweats & yoga pants besides actually going to exercise. Well said Sarah. I very much agree. Sylvia – thank you so much for the interview. It was a lot of fun actually thinking about what my style and how I related to the clothes I wear. I always enjoy what you bring in your blog and embracing that there’s style after 40. Thanks so much for participating Alice. It’s always so interesting the read the answers to my questions! I’ve been following Alice for some time and enjoy her use of color and pattern. I think she’s a great example of a woman that knows her style and I like seeing her choices. Ann – thank you so much for your kind words. I have really enjoyed following you and love how each of your outfit seems so curated just for you! I am following Alice for nearly a year now. I discovered her through 40+ Style as she usually joined a challenge. She is very daring. More than me. And often I try to copy her haha. Greetje – that’s how I found you too. I’ve enjoyed following you and sharing comments with you. So happy you featured her Sylvia. LOL…Suzanne…I know we bankers are a boring bunch 🙂 Hope you are feeling better! You must be the most colorful banker in North America (if not in the world), Alice! You have a wonderful wardrobe, so many beautifully detailed pieces! I love the way you combine them. You always look so cheerful and youthful, and very trendy in your clothes! I think you express an amazing amount of creativity through your style, and it is in no way shallow. I really enjoyed your interview! Thank you for your blog and thank you, Sylvia, for another wonderful personality you introduced us to! Thanks Kim! The leopard ankle strap heels is one of my all time favorite outfits too and I would not have pair them items together had it not been reading other fashion blogs and getting inspiration from others. So great to see Alice featured here! I always gravitate towards neutrals and love to see her outfits for inspiration. Hope you both have a wonderful day! Thank you for the introduction. I admire how she mixes prints. Great interview. She looks super good in all outfits but but does not look like she’s trying. There is something about Oriental women, they just have that knack of dressing so well. She looks like a model. 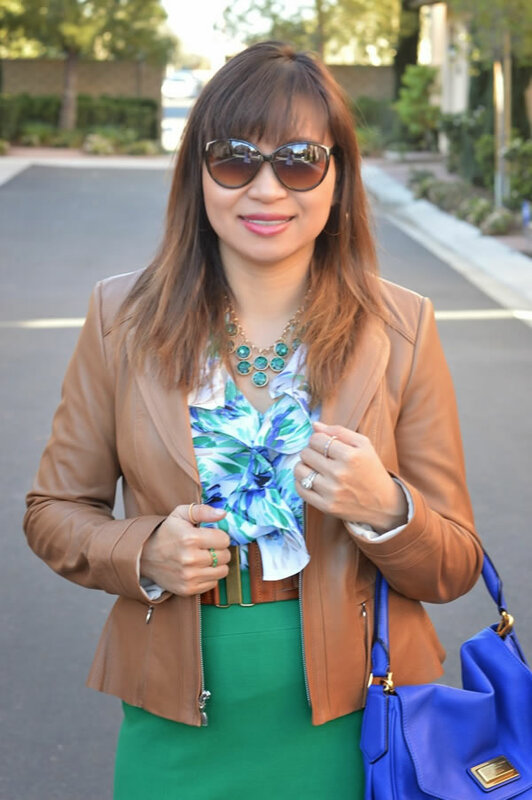 Previous post: Combining my bib necklace with color! What do you prefer?